Brighton is such an amazing place to live, and it's so nice to spend the day exploring the city! Last week my friend recommended that we should try out this really nice café located in the lanes. It is quite well known for its wacky interior and decorations, as well as it's delicious coffee and food - so it sounded like the perfect place to have lunch. The café is so cute and unique. Inside there are allsorts of crazy props and decorations used to make it look so cool. Hung up around the coffee shop there are lots of flags, exposed lighting, picture frames, figurines, sculptures, fake plastic limbs (a little creepy ngl), paintings, road signs, plants, fairy lights, postcards, plastic animals - basically anything you can think of!! We ordered our food downstairs. 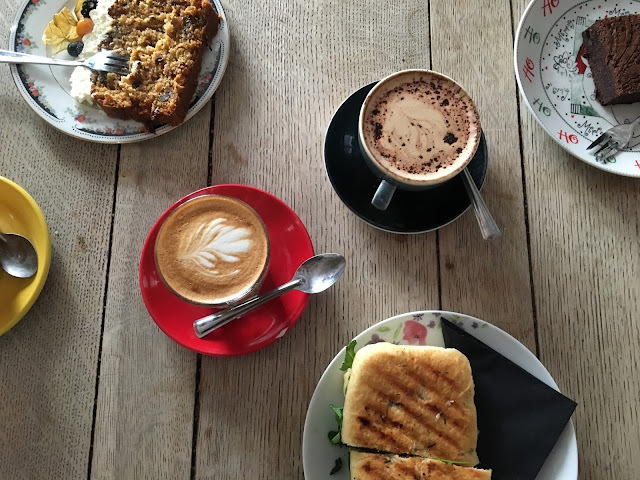 I opted for a latte and a pesto, mozzarella, tomato, rocket, olive and rocket panini for lunch, and my friends tried some of the cakes that were on offer (which looked incredibly delicious). Then once we had ordered our food and drinks we headed to the seating area upstairs. The rooms upstairs were covered in magazine pages from retro music, fashion and comic magazines, and lots of wall paintings too. It looked amazing! The food was delicious, and I had such a cute coffee date! Before heading off we decided to check out the garden zone at the back of the coffee shop. It looked so nice with the fairy lights and bunting hung across the seating area, and graffiti on the walls, oh and the sun beds laid out to sit on looked so cool too! After our cute lunch date we headed to the sea because it was such a nice day, and Brighton beach looked super cute!